The landscaping around your home should have a definitive line between the garden areas and lawn. 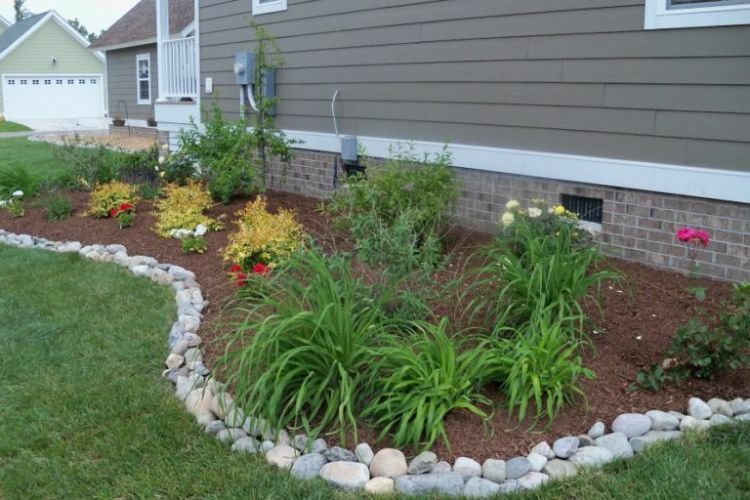 Not only does this keep unruly grass out of gardens and flowerbeds, but it also creates a beautiful visual accent. 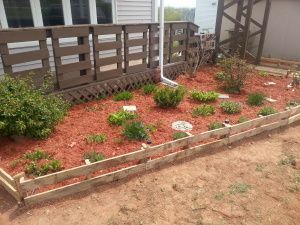 Choices in garden edging are many, ranging from upcycled items such as pallets and wine bottles to traditional stone or rocks. With so many options, one is sure to fit your style. Here are some ideas. Stone blocks are among the most popular choices and are readily available at home and garden centers. They come in a trapezoidal shape, and you can lay them in a straight line (by alternating the shapes) or use them to form curves and undulations in the landscape. 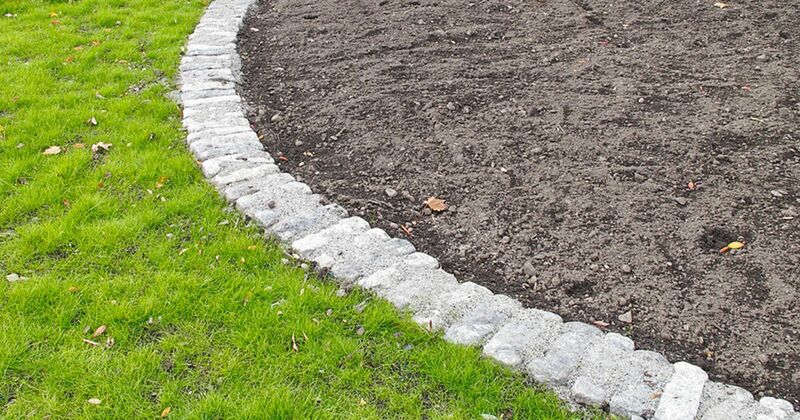 They require little to no prep work; you just lay the edging stones at the border of the garden area, butting them up to the grass. A single row works well, but you can build the stones higher by stacking them and staggering the joints. 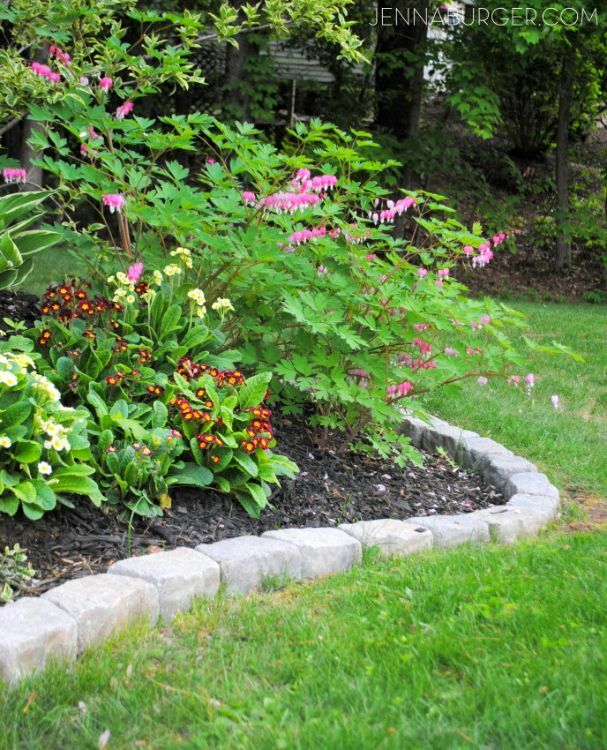 Cinder blocks on their sides form a unique border for your gardens — and add extra planting space. 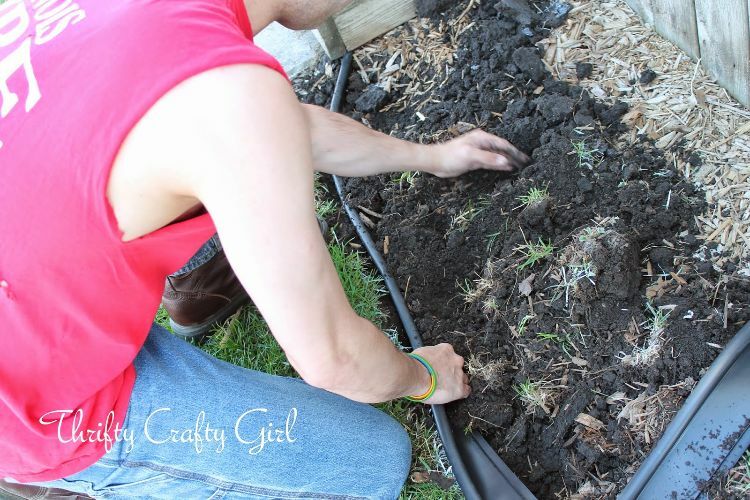 Fill the holes in with soil to create a few more spots to tuck annuals or herbs. 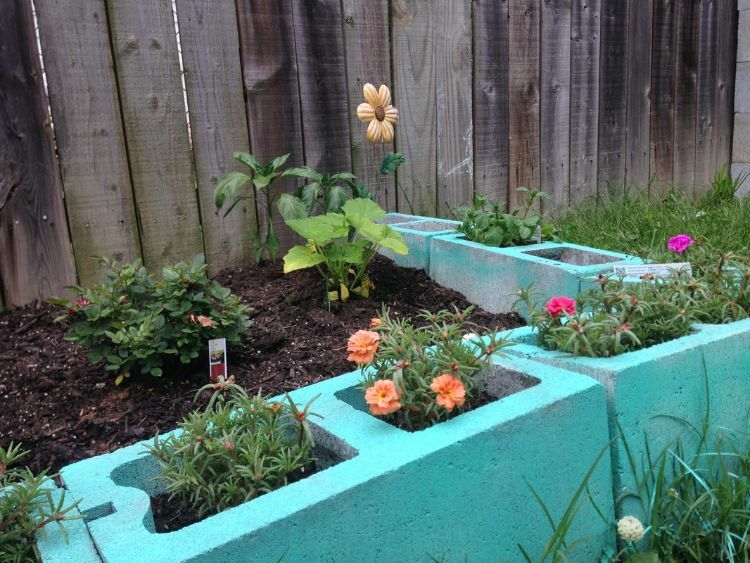 Painting the cinder blocks brings a pop of color to the garden. 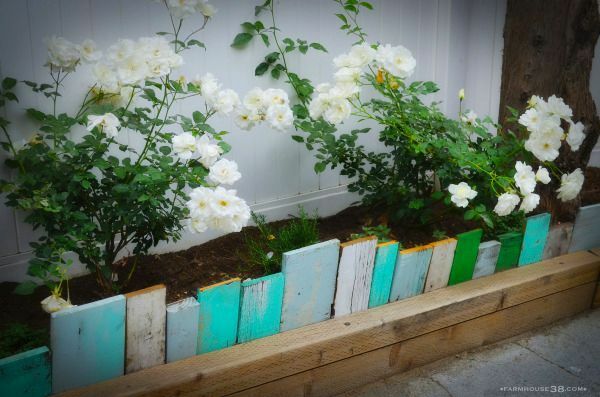 You can create an eclectic garden border using some scrap wood pieces and fun paint colors. Collect wood scraps in different thicknesses and lengths, cutting them down to shorter pieces if necessary. Paint the pieces with a quick coat or two of paint in various colors (or just skip the paint and go for the natural look). You don't even have to cover them completely if you're going for a shabby-chic look. Installation is very simple: Using a hammer or mallet, pound one end into the ground where you want your border to be, placing the wood next to the previous piece. Vary the colors, sizes and thicknesses to create a unique look. Transform fallen timber into garden borders easily with the aid of a saw and some extra manpower to move them into place. 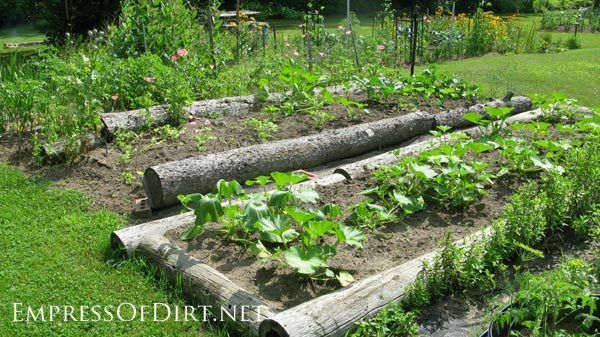 Cut them to size and lay them on their sides to frame out rectangular beds for a rustic design element in your landscape. Collect (or purchase) rocks in various sizes, and simply lay them out where you want to create definition. Rocks in a mix of sizes and colors create a border of unique beauty. No more throwing those empty wine bottles away! Remove the labels, clean the bottles well, and stick them upside down into the ground to create a unique border. 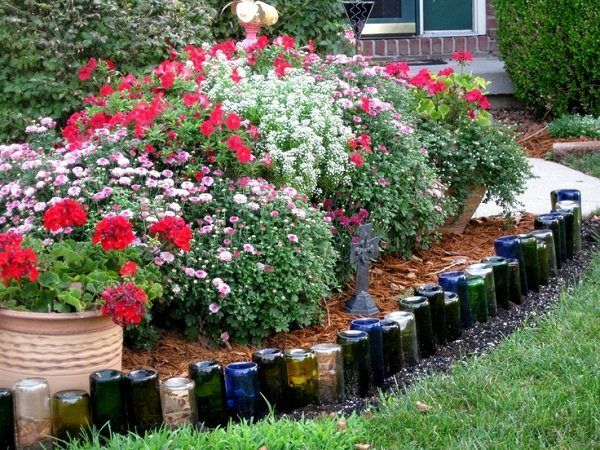 Vary the colors of the bottles and place them at different heights to add contrast. Pallets are incredibly popular in crafts and home decor right now, so it's no surprise to see them used in landscape projects. Remove the boards on the bottom side of the pallet, and then cut the pallet in half so the slats go from side to side. This will create two usable pieces. Cut the boards that will go into the ground flush with the top side-to-side piece, but allow them to extend a few inches below the bottom piece to give you something to stick into the ground. Hammer the pieces into the ground, creating your border, and then nail them together to keep the frame from tipping over.